Out of all the searches that drive readers to my blog, one of the top search phrases has always been “healthy cooking for beginners”. I get lots of questions about how to meal plan, how to shop, and how to, well, cook! I’ve had people tell me that their eating habits are horrible because they “can’t cook”, and so they resort to pre-packaged foods, fast food, and dining out way too often. 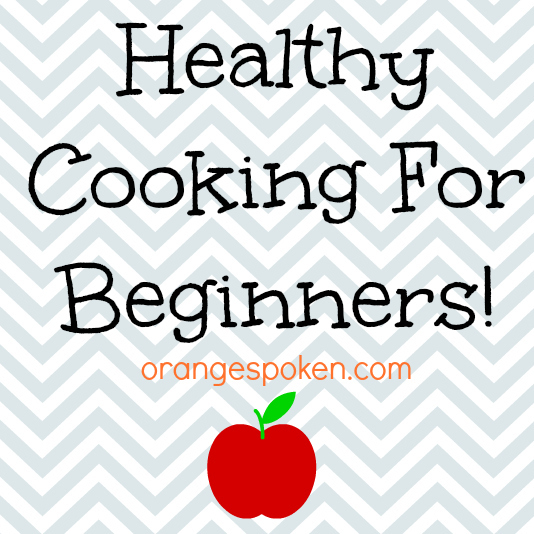 Well, I’m here to tell you that healthy cooking is EASY! No seriously, I promise! Here are my tips for getting started in a healthy at-home meal prep and cooking routine… and making it a life-long habit! I cook 4-5 days a week, and on the weekends, we dine out. I do all of my shopping and meal prep on Saturday or Sunday morning, but if those days don’t work for you, find and commit to a day that does! 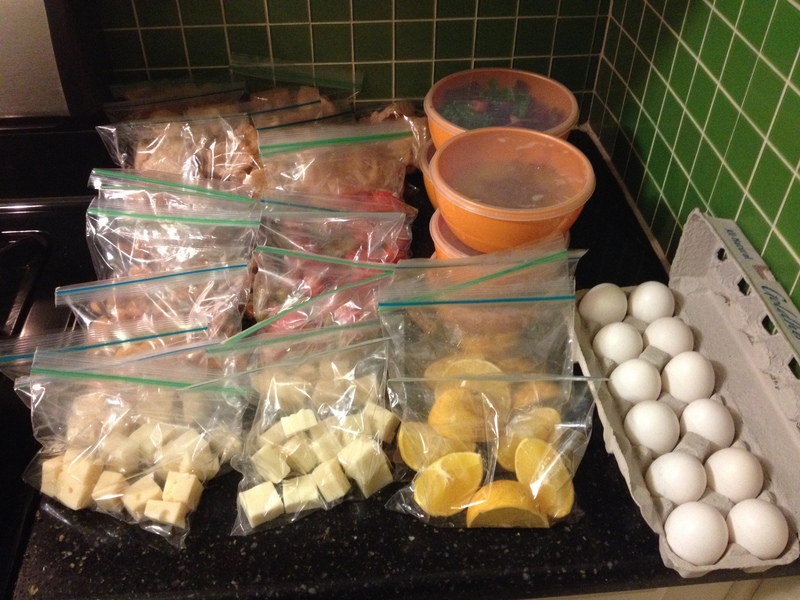 You don’t need to shop AND prep on the same day, so divide the time into two separate days if necessary. What is in your fridge and pantry right NOW? If your goal is to eat and cook healthier meals (and you’ve defined what that means to you), start with an analysis of your current food supply. Take an inventory of what you have in your fridge and pantry and identify anything that doesn’t align with your healthy living goals. Pre-packaged items that have 5+ ingredients can be the first to go. Anything that contains MSG, high fructose corn syrup and/or giant words that Siri wouldn’t even be able to pronounce shouldn’t be going into your nor your family’s bodies so those can go too. Take a look at your spice cabinet as well and look for the same kinds of words on those labels. If you’re feeling guilty about throwing those items away, consider donating them to a food pantry or soup kitchen. What are some of your (and your family’s) favorite foods? If you live alone, think about what you enjoy eating. Make a list and cross off the items that are prepackaged, processed crap. Grilled chicken? Keep. Pop tarts? Cross it out! Focus on what’s left uncrossed on the list and keep that list handy when planning meals. Have children or a spouse? Consider giving them the same survey and collecting info about what their favorites are. Are donuts making an appearance on your list? Instead of scratching these off, think about how you can make treats like this from scratch with whole ingredients. Give yourself permission to think outside of the box. Almost ANYTHING (bagels, waffles, cookies, pizza) can be made to fit your healthy cooking goals! I make these low carb, no sugar, keto friendly chocolate chip cookies that are out of this world good! It’s not about restricting what you’re eating, it’s about rethinking what you’re eating. What tools do you have in your kitchen? Keep it simple. All you really need for healthy prep and cooking is a sharp cutting knife, cutting board, vegetable peeler, can opener, saute pan, baking sheet/jelly roll pan, food processor OR blender, a simple slow cooker (think $20 at Target), a somewhat deep pot, your oven (of course), a spatula and a wooden spoon. What’s your weekly grocery budget? This is a big one, as healthy eating sometimes comes with a higher price tag if you are unfamiliar with how to shop smart. Consider shopping at a local farmer’s market or joining a co-op to save money on fresh produce. Look for BOGO deals and other sales on meat at local supermarkets and stock up (if you have the space) when you find a good deal. Join a rewards club or a bulk store membership. Check out stores like Aldi and Trader Joe’s that are both significantly cheaper than other grocery stores. Plan meals that are heavier on vegetables (like stews) which will stretch your dollar further since vegetables are cheaper than proteins. Whether you’re completely new to cooking or cook regularly, plan to prepare 2-3 healthy meals each week to start. You can easily double most recipes, giving you leftovers that you can freeze, take to lunch or serve for another dinner option that week. Most recipes can be used in other ways as well (think slow cooker pork roast becomes pork tacos another meal). Before you start your weekly meal plan, think about what you currently KNOW how to do. Can you roast? Think roasted veggies and roast chicken or turkey cutlets. Can you saute? Think sautéed chunks of chicken and veggies for stir fry, mushrooms and onions for burger, steak and chicken toppings, fish filets with a little butter, lemon and fresh herbs, ground meats like chicken and beef for tacos, lettuce wraps and meat sauces over veggie noodles (like thinly sliced ribbons of zucchini). Can you bake? Think baked whole chickens stuffed with lemon wedges, fresh herbs and drizzled with olive oil, salt and pepper, homemade meatballs lined up in a dish and baked until golden brown, and homemade frittatas with eggs and veggies like spinach, onions and fresh herbs, for breakfast options. Can you turn ON a slow cooker? Think slow roasted pork loin, brisket, chili, soups, shredded bbq chicken, chowder. Can you boil? Think boiled sweet potatoes topped with ground beef, veggies and shredded cheese, thinly sliced ribbons of squash or zucchini (as a pasta replacement), hard boiled eggs to add in salads, and cauliflower, rutabaga or parsnips boiled then mashed with milk and cream cheese. Think about what you CAN do and build on those strengths. Sure, there will be times when you might try a recipe that’s a big fail (I’ve done it PLENTY of times), but it certainly doesn’t mean you should throw in the towel. Cooking is a science. It’s all about exploring and testing different flavor combinations that work and please you and your family. Don’t be scared to play around. And, try being a little adventurous during each trip to the market! I like to try and purchase 1 new item at the market each time I visit. Maybe it’s a new vegetable, or a fish I’ve never tried. This keeps things interesting in the kitchen, and teaches me to learn to like new things (and not be scared to cook them!). Once you’ve established what you know how to do as far as technique goes, grab a pen and pad and get to work on a list. I try to never complete a big grocery trip without a list. If you’re thinking about going low carb, low sugar, and ketogenic (like me), feel free to use and print the list I’ve made with foods that support this way of eating which you can find in any local market. You can find the list here. If you just can’t seem to give up carbs completely, consider trying to whip up meals that use quinoa as a rice or pasta replacement. You can click on this link to learn all about purchasing and preparing this ancient seed. You can also try using cauliflower as a rice replacement! It’s delicious! Here is a recipe for cauliflower “rice”. Squash, zucchini, and spaghetti squash also make a great pasta replacement. Check out Rachael Ray’s recipe for zucchini noodles, this recipe for spaghetti squash and sausage bake (think baked ziti!) and my recipe for unpasta lasagna with squash and eggplant instead of noodles! Breakfast: Try blending fruit and almond milk with unflavored whey protein for a smoothie. Want something warmer? How about mini fritattas and crust-less quiches? I make them ahead of time, freeze or refrigerate them, then warm them up throughout the week for breakfast. You can add your family’s favorite veggies, cheeses and meats. They’re easy, portable, healthy and delicious! Low carb cream cheese pancakes are also an easy make ahead breakfast item that you can refrigerate or freeze, then warm up when ready. Lunch: I split my time working from home and traveling for work. When I’m at home, lunch is usually dinner leftovers or snack plates (cheese, deli meat, olives, pickles, fruit, veggies). We try to grill out on Sunday evenings, giving me an opportunity to grill up extra chicken (breasts or boneless/skinless thighs) and burgers then pack those for lunch (think grilled chicken salads and burger salads). When I’m traveling, I’ll pick up pre-made salads from the grocery store, or purchase items to make snack plates on the road so that I’m not leaning on fast-food. Snacks/Dessert: I love munching on celery with almond butter (ingredients should just be nuts+salt), energy balls, cheese cubes, pork rinds, guacamole, fresh salsa (in the produce section or make it yourself! ), raw nuts (like walnuts, macadamia nuts, and almonds), 85% or higher dark chocolate, and fresh whipped heavy cream with cinnamon, nutmeg and ginger with fresh berries. I also like to boil a dozen eggs at the beginning of the week for hard-boiled egg snacks, or to toss into salads. Dinner: I plan on grilling once a week (grilled chicken, burgers, steaks, fish wrapped in foil with veggies). Once a week I make a roast in my slow cooker (pork loin, brisket). Sometimes I’ll bake a whole chicken (great for chicken salad with the leftovers!). I’ll use leftover grilled chicken or homemade meatballs paired with one of the pasta alternatives mentioned above. Big pots of chili or soup are also great go-to dinners that make for delicious leftover lunches. Some of my favorite sides are mashed cauliflower or rutabaga, butternut squash, roasted veggies, and sweet potatoes. Beverages: Water with lemon or lime and fresh mint, coffee with half and half and cinnamon powder. I love to flavor water with berries, citrus, and fresh herbs like basil and mint. My latest craze is sparkling water (Think LaCroix!). It’s such a satisfying treat! This is just a sample of what my week looks like as far as meal planning goes. Remember, build on your strengths in the kitchen, and food likes to help create your own family favorites that are healthy, and you can feel good about cooking each week! When you head to the market, stick to your list. Try to shop the perimeter of the store (produce, meat/poultry/fish and dairy. Head to the center aisles only for things like nuts, healthy oils (coconut, olive oil), dried fruits and seasonings. And never shop on a hungry stomach. Let your list guide you, not your brain! Want to save even more time? If you find that you have extra time on those weekend prep days, consider roasting veggies, baking sweet potatoes and steaming cauliflower for sides! Store them in containers, refrigerate or freeze then warm up when needed throughout the week, that way you’ll only need to focus on cooking your protein on busy weekday evenings. Stews, chilis, cooked beans and soups also freeze well ahead of time, so when you have the time, whip up these dishes in advance and store them in your freezer for when you’re in a pinch and are dangerously close to hitting the drive thru. Get into the habit of labeling containers and Ziploc baggies before you store them away in the freezer. When times get really crazy, you’ll be glad you did! Low carb green bean casserole!